5 + six = Required Please enter the correct value. With the Dow Jones Industrial Average down nearly 9% since the start of the year, many investors expect bear market 2016 to drag stocks down further. 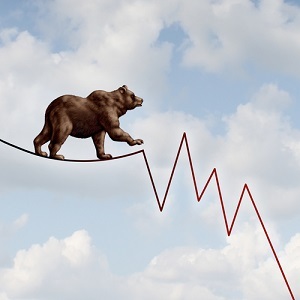 A bear market has a few definitions, but many agree it involves a 20% drop in the major stock market indexes over a two-month period. We're actually seeing a stock market correction, which is a 10% downturn in the major indexes. Stocks are down 14% from their highs in May 2015. Money Morning Global Credit Strategist Michael Lewitt believes bear market 2016 is already here. "Truth is, we are in a bear market – more than 50% of S&P 500 stocks are down 20% or more from their 52-week highs," said Lewitt. "It is now a question of how loud the bear growls…"
We've been expecting a market downturn since November. That was when Money Morning Capital Wave Strategist Shah Gilani predicted the Dow would fall to 15,000. On Jan. 15, the Dow touched the 15,000 threshold, dipping to 15,988. "The markets today are obviously weak," said Gilani on the FOX Business Network this week. "I think they could get weaker. There's nothing fundamentally strong anywhere globally. All of the major markets are in a downtrend." It's easy to forget, but we were just in the longest bull market since World War II. Since hitting a low of 6,626 in 2009, the Dow has climbed 177% to May's high of 18,351.36. A market cool down is normal and expected. What's Triggering "Bear Market 2016"
When there are big dips in the stock market, it's typical for investors to pick up their favorite stocks for a bargain. The conventional wisdom has always been to sell the rallies and buy the dips. That buying supports stocks rallies, and the market continues along without any major disruption. We're looking at a mental sell-off, according to Fitz-Gerald. "The markets are all about sentiment," said Fitz-Gerald on the FOX Business Network Thursday. "They're a forward-looking animal and they're all about certainty or uncertainty, and traders now are uncomfortable with that." Investors' emotions are running high. That's understandable. Many feel a disconnect between the stock market's sterling performance for the past few years and the underwhelming 2% GDP growth the U.S. economy has been logging since the Great Recession. Concerns about slowing growth in China and Europe are also playing into investors' fears. The collapse in energy prices is weighing on the markets, too. But neither of these negative developments tells the full story. The truth is, the surge in asset prices artificially engineered by the U.S. Federal Reserve is slowing down. Investors are realizing the lack of strength in the U.S. economy. They're seeing through dubious statistics, such as the unemployment figure, fed to them by government bureaucracies. Despite all of these things, Fitz-Gerald says investors still have a unique advantage in the markets. "Institutions have to keep their money moving," Fitz-Gerald said Thursday. "Good, bad, or ugly, they have to continue to trade. Individuals can be very careful and very selective." We'll continue to bring you more on which stocks are bringing great opportunities for long-term investors, plus the best ways to trade these big market swings for immediate profits. Cameron Saucier is an associate editor for Money Morning. You can follow him on Twitter and follow Money Morning on Facebook. Tags: Bear Market, bear market 2016, bear market for 2016, bear market in 2016, Market Downturn, selloff, stock market correction.